Aren’t they beautiful?! According to the lovely, fabulous, wonderful people at bugguide.net (did I’m mention that they’re fantastic? ), the stripey beetles are Paranaemia vittigera, a member of the family Coccinellidae. 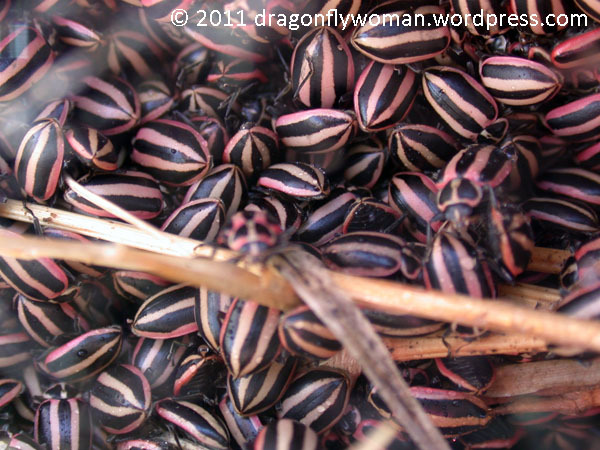 Striped ladybugs! Super cool beetles, especially in such huge numbers. They’re gorgeous! They look like sunflower seeds. I thought those ladybugs were beans. Ha ha! I could see that, but nope. They’re ladybugs. Much less tasty than beans for sure.